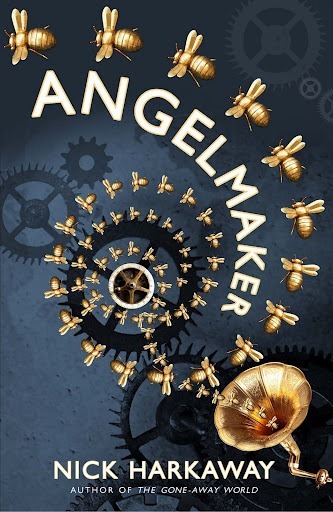 Angelmaker is Nick Haraway’s second novel after his BSFA award nominated debut, The Gone-Away World. Harkaway introduces us to Joshua Joseph (Joe) Spork. To underestimate him would be to call him a watchmaker, to be more accurate, he is a master of all things mechanically unique. If it is broken, he can fix it and if he can come up with the idea, he can make it. This unique talent has been handed down from his Grandfather and his Father, although his Father was better known for his more criminal and mob-like dealings than his technical skills. Although Joe Spork has spent his entire adult life trying to shake his father’s reputation, when his friend asks him to fix a piece of automata and then look at a very unique book, he may have to change his mind. When the book falls into the wrong hands, it’s used to start a number of machines which are hidden across the globe. As these hive-like machines slowly release colonies of perfectly constructed metal bees, the world goes into a panic. Where have they come from, are they dangerous, are they part of a terrorist attack? Meanwhile, in a small London flat, an old lady called Edie has just killed two assassins who were sent to put an unnatural end to her life. She packs a bag, grabs her fearless pug and leaves her home for good. She knows the secret of the bees, she knows what they were meant to achieve but also the pure evil they have the potential to be. At last, a new, awesome steampunk story without main a feisty female lead in a brown leather corset. Of course there’s a place for that but it’s become a bit of a cliche recently so this novel came as a blast of fresh air. The fabulous descriptions of automata and inner workings will make any steampunk fan’s toes curl in utter delight. Harkaway also creates some amazing imagery of the darker, underground of London including the dankest sewers to the secret criminal markets. With amazing locations, extraordinary machines and quirky characters, Nick Harkaway has penned a beautifully crafted page-turner. It’s lovely to get to the end of a book and instantly think of a number of people who would also love it, which is exactly what I did. I will keep my fingers tightly crossed for more fiction coming from Nick Harkaway soon!